With thousands of entrants from all over Canada a single winner was randomly drawn…drum roll please…Cassy Knegt from Grimsby, ON! 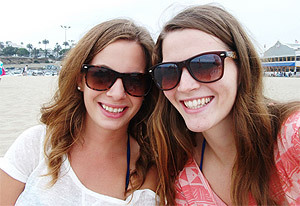 Cassy ultimately opted for the California getaway and took her friend Kristina on a shopping mission to L.A., where she stayed at an awesome hotel, toured Beverly Hills, Santa Monica, got pampered at a relaxing spa and hit the shops armed with an extra US$500! After much anticipation, the day finally arrived, and we were more than ready to leave for sunny California. 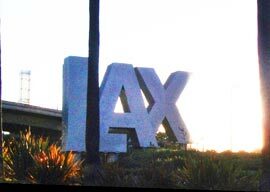 The flight seemed long, but we were very excited when we finally hopped off the plane at LAX. 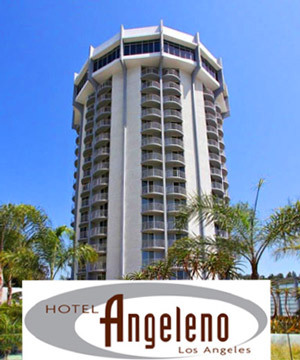 We took a cab up to our beautiful hotel—Hotel Angeleno, located beside Sunset Blvd between Santa Monica and Beverly Hills. The view from our eighth-floor room was beautiful. We almost went straight to sleep, each in our own queen-size bed. Instead we decided to grab some California Pizza and start our shopping spree a little early. 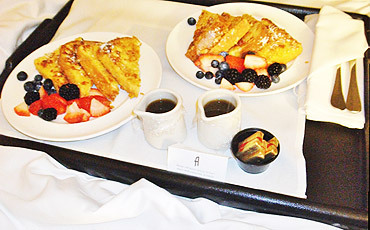 Upon returning to the hotel, we decided to treat ourselves and ordered breakfast in bed for the next morning. I wouldn’t mind waking up to that from now on! After breakfast, we started in Beverley Hills, where we met with Karissa Fowler, from the Beverly Hills Conference and Visitors Bureau, who took us to Sprinkles, which boasts a cupcake ATM—needless to say this was a highlight of the trip. She also took us down Rodeo Drive. On a trolley tour through Beverley Hills, we spotted many beautiful houses owned by celebrities. Afterward, we enjoyed lunch at the Cheesecake Factory and then went to Santa Monica for some more shopping on 3rd Street Promenade. After a long day, we headed back to the hotel and slept like babies. The next day we explored the Getty Centre, taking the tram up the hill to spend the morning there, enjoying the beautiful gardens, architecture andspectacular views of Los Angeles. 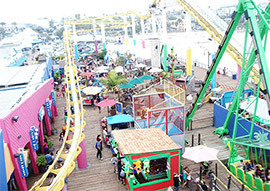 After that was Santa Monica, where we got day passes to Pacific Park (the amusement park on Santa Monica Pier); the ferris wheel gave us the best view of the beach and the ocean. We were then directed to the Fairmont Hotel for a wonderful half-hour massage at Exhale Spa. Although it was unusually cool and wet that day, we enjoyed the sand and the sea for a while before heading to Santa Monica Place, an outdoor mall where we shopped for the remainder of the day. Thanks to our fabulous destination partners! Huge thanks to the lovely ladies at the Los Angeles, Beverly Hills and Santa Monica tourism boards! What can we say…we love LA. And, of course, a big shout out to our contest sponsor, Sharpie!